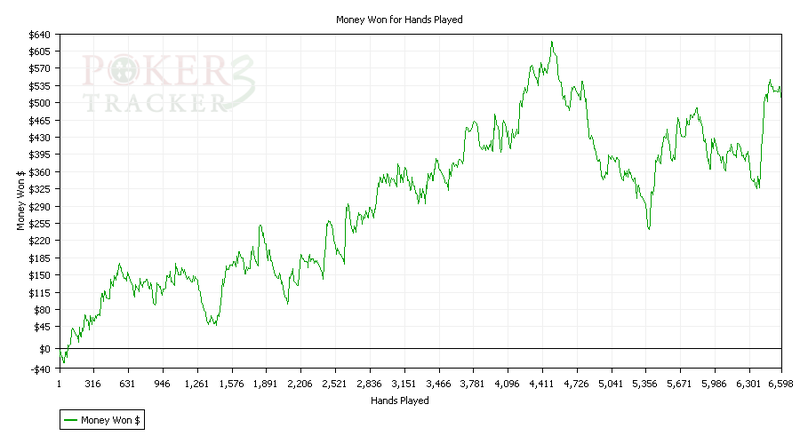 Here’s an impressive looking graph from my limit hold’em play last month. Sadly, it only tells half the story. I really needed that big upswing to get back even. 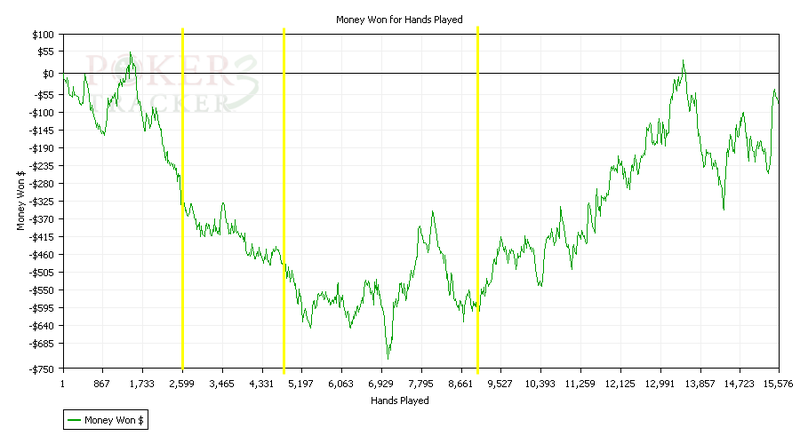 The yellow lines on this graph show the end of each month that I’ve been playing $2/$4 and $3/$6 on the iPoker network. Things did not start well, so "about even" is not only a good result relative to how I’d begun, but it also seems to be a very good result in this game. The tables are overrun by rock-tight bonus-grinders, many of whom play little more than 10% of the hands they’re dealt. As that’s exactly what I’ve been trying to do, it would be hypocritical to call them nits. Hyponitical, perhaps. I have to assume that the regulars I see all the time and assume to be professionals are all well-compensated for their efforts because among the familiar names – all of whom are all logging tens of thousands of hands every month - almost nobody is actually making money at the tables. For me, the extra money I get is 25% rakeback and a $10 bonus for every 1,000 player points. So while Poker Tracker says that I’m about even, my balance says that I’m actually $766 up from where I started. I’m also getting close to being able to cash in my player points for an ipod nano. I don’t want it, but their store has a fairly limited selection and it’ll sell on ebay. Call it another $100 in added value, because I should get there in a week or so. So in total that’s $866, and Poker Tracker tells me that I’ve paid $1460 in rake over nearly 16,000 hands. Overall, that’s equivalent to nearly 60% rakeback, which ain’t bad at all. I’d get a slightly better deal if I played more, too. With this level of payback, you could sustain a loss rate of 1 big bet per 100 hands and still break even (the actual figure is -$5.41 per hundred, based on my data at $2/$4 and $3/$6). So if you are able to lose money no quicker than that, there’s a clear profit potential from playing poker under these conditions. Until recently, I was losing a little faster than that: 1.25BB/100. So, given my sudden change in fortune this month, is is possible that I suddenly started doing something right? I really can’t say for sure, it’s much too early to know whether I’m simply on a nice long hot streak. I’m still finding it hard to believe that I have actually won it all back, and given that I can’t recall seeing more than two long-term winning players in this game the whole time I’ve played it, I’m a long way away from even thinking that I could be the third. But I did make one change to the way I played this game, which was to adhere to strict criteria about not only which tables I played at, but also the seat I sat in. In fact my rule is pretty crude: A player makes my buddy list by playing more than 30% of hands, and if I can’t sit within two seats to the left of a buddy, I don’t sit down. 30% of hands might not sound excessively loose, but the typical range for strong players in this game is more like 15% so looking for anyone playing at twice as many hands as this, and then making sure I had position on them for the majority of the hands I would play, seemed like a good place to start. That’s it. I hoped that improving my game selection would help me lose less quickly so that I could grind out a little profit from bonuses and rakeback. If it can actually turn me into a winning player, that would be simply stunning.